SX300 is a two part general purpose smoothing underlayment for interior applications. 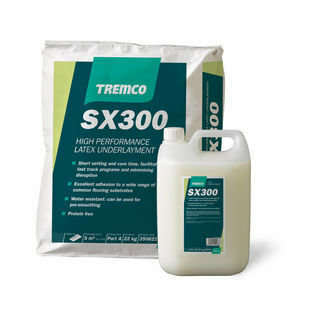 interior applications.SX300 is semi levelling and is specifically designed for the preparation and smoothing of interior subfloors prior to the application of a liquid applied damp proof membrane and receiving a floor covering. Excellent adhesion to a wide range of common flooring substrates, including: concrete, sand/cement screeds, flooring grade asphalt, TREMCO surface DPM’s, etc.